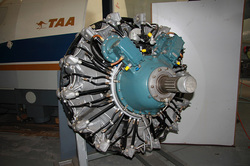 The R-2000 was an enlarged version of the Pratt & Whitney R-1830 Twin Wasp, with focus on reducing the manufacturing costs and fuel requirements. The bore was increased to 5.75 inch, while it still retained the 5.5 inch stroke. This brought displacement up to 2,000 in³. There were a number of detail changes from the R-1830, such as front-mounted instead of rear-mounted magnetos, plain bearings for the crankshaft rather than roller bearings, and 87 octane fuel (specified because there were fears wartime supplies of 100 octane might fall short, but those fears were groundless). The R-2000 produced 1,300 hp @ 2,700 rpm with 87 octane, 1,350 hp with 100 octane and 1,450 hp @ 2,800 rpm with 100/130-grade fuel.